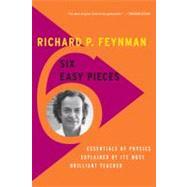 The six easiest chapters from Feynman's landmark work, Lectures on Physics-- specifically designed for the general, non-scientist reader. The late Richard P. Feynman (1918-1988) was Richard Chace Tolman Professor of Theoretical Physics at the California Institute of Technology. He was awarded the 1965 Nobel Prize for his work on the development of quantum field theory. He was also one of the most famous and beloved figures of the twentieth century, both in physics and in the public arena.